Are you a hat lover? You're in the right place. I'm one too. 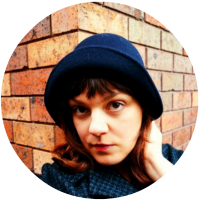 My name is Tanith, and I adore hats, in particular vintage style hats. I started making hats almost 10 years ago as a hobby, and over time I've devoted myself to researching vintage styles, learning new millinery techniques, and creating my own style. As well as being stocked locally at the Blackheath Hub, my hats are available from my Etsy shop and by custom order. 6 Easy Ways to Temporarily Trim a Plain Hat. Read reviews of free vintage hat patterns and tips for completing them in my Trove Pattern Project. If you sign up for the newsletter, you'll get a fortnightly email with the latest blog posts, great links and resources, style inspiration and more! I'll pass that compliment on!